Pradip Mascharak, professor of chemistry and biochemistry, has received the 2015-16 Outstanding Faculty Award from the Division of Physical and Biological Sciences. The annual award is the division's highest honor for faculty achievement, recognizing combined excellence in research, teaching, and service. Mascharak's research focuses on the structure and function of enzymes, green chemistry, and designing novel drugs for cancer and other diseases. The author of more than 200 peer-reviewed publications, he is also recognized as a gifted teacher and mentor. "Professor Mascharak has an outstanding record in research, teaching and exceptional service to the campus and the broader scientific community. The Outstanding Faculty Award...is a richly deserved campus recognition for his exemplary record," wrote Paul Koch, dean of physical and biological sciences, in a letter announcing the award. In recent years, Mascharak's lab has been studying and synthesizing photoactive compounds that release nitric oxide or carbon monoxide when exposed to light. Since nitric oxide and carbon monoxide are biological signaling molecules with antimicrobial and other properties, there is great potential to use compounds that release them in biomedical therapies. Mascharak's work with nitric oxide complexes has shown promise for both cancer therapy and antimicrobial treatments. For example, in collaboration with chemistry professor Scott Oliver, Mascharak has developed a composite powder that can be applied directly to a wound or incorporated into a bandage to prevent infection by drug-resistant bacteria. Since he began this thread of work in 2002, Mascharak has published nearly 70 papers in top chemistry and medical journals, and several of the complexes he developed have been patented. Despite teaching challenging courses, Mascharak regularly receives exceptional student evaluations. Over the course of his tenure at UC Santa Cruz, he has advised 24 Ph.D. students who have graduated, eight of whom are currently faculty members at other institutions. For his exceptional work mentoring minority students and encouraging them to succeed, he received the Excellence Through Diversity Award. Mascharak is a fellow of the American Association for the Advancement of Science and the recipient of a Sloan Research Fellowship. 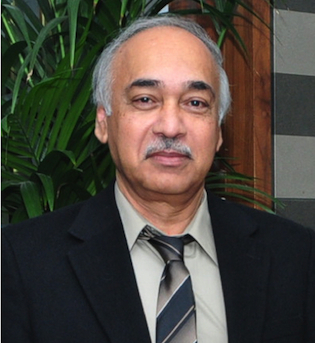 In 2017, he will receive the Chemical Research Society of India Medal, a highly selective award given to scientists of Indian origin who have contributed extensively to the promotion of the field. This great honor follows another unique achievement in 2014, when Mascharak was awarded the Mahatma Gandhi Pravasi Samman Gold Medal in a ceremony at the House of Lords in London. This award recognizes outstanding service and achievements by Indians in the international arena. Mascharak earned his B.S. and M.S. degrees at the University of Burdwan, India, and his Ph.D. at the Indian Institute of Technology, Kanpur. He joined the UCSC faculty in 1984.